Politics. Right next to religion, political views are among the most painful things to discuss. They aren’t so much topics as pre-made arguments, like hot pockets full of anger and grief. As we enter adulthood we are expected to pick a side, so that when the time comes we’ll know what issues we’re supposed to support and which ones we’re supposed to shake our fists at. 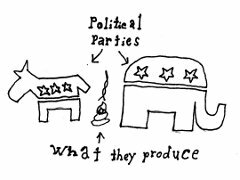 I hate everything about politics, from the way it splits us up as a nation to the fact I can never decide if “politics” is plural or singular. * And thus, like all things I hate, I’m going to talk about it/them. First off, it was decided a long time ago that there would be two parties, in this case Democrats and Republicans. Oh sure, there are other parties, Green and Reform and the like, but there were also six members of the Three Stooges, so let’s not kid ourselves. You always end up with two sides in any major conflict or competition, for some reason. Are there any sports besides pro wrestling that allow more than two teams to compete at once? I wonder why two is the magic number. My guess is that its because, on an individual basis, there are already two sides: Me and Everybody Else. Since the “Everybody Else” side of the equation tends to be rather large, to even the odds we’re willing to compromise and make it Us and Them. Once that’s done, all that remains is to decide which Us you belong on, and compare notes. That’s where it gets confusing, because once you pick a side, you end up getting a whole lot of baggage you weren’t ready for. What’s that? You think abortion ought to be a valid option? Well then you’re against capital punishment, too. You think that there ought to be tax reform? Well, that means you’re against gay marriage. I don’t know who picked which side got which issues, but they made some weird decisions. That’s the way things are, so you’ve got to go with the flow, unless you want to end up as a Shemp. Or worse, a Joe Besser. Some people (at this point most of the people I know) are so sick of the rules or so apathetic about the process that they’ve decided to stop playing the game. They don’t vote. I, on the other hand, do vote. And I HATE politics. I care about as much about them as I care about the contents of a homeless man’s bladder: I’ve got a pretty good idea what it is, but as long as it doesn’t end up all over me, I don’t want to know about it. Democrats are donkeys and Republicans are elephants. The one thing that they have in common is that all they produce is crap. And yet, despite the fact that I feel this way, I’m going to be making a decision. Not only that, but since the same number of decisions are now being made by fewer voters, that means that my vote is even more powerful. As are the votes of all of those people who are making the game such a mess to begin with. And when you’ve got polarized lunatics and people who are actively antagonistic to the whole process making all of the choices, well, you get what we’ve ended up with. A bundle of noisy idiots trying to keep all of the other noisy idiots from doing anything that they want to do. Like I say, I hate politics. I have so little interest in politics, I actually have negative interest. When I talk politics, I make other people LESS interested. Your boredom is evidence of that. But the alternative is anarchy, which way too much effort for me. I’d have to go buy a gun and a leather jacket with studs. Probably a chainsaw too… Too much hassle. I guess socialism or communism are alternatives to what we’ve got now, but those are based on sharing. If my kindergarten class was any indication, the big kid would end up with all the cookies anyway if the teacher didn’t intervene, so it would pretty much end up as anarchy with a bureaucracy. Road warrior + accountants, which sounds more hilarious than it is, I’m sure. And a monarchy won’t work because we’re Americans. We’ve got a bad history with monarchies. So that leaves us with Us versus Them. This is the point where I would normally bring this whole thing to a valid and thoughtful conclusion, but I don’t have one. This was just distracting, time consuming, arbitrary, and in the end utterly pointless. Just like politics. How’s THAT for a metaphor? * Seriously, which is it, plural or singular? You would say “The topic is politics”, not “The topics are politics”. But saying, “Politics is my least favorite topic” makes you sound like a dope. And what the heck would a single politic be? THIS STUPID LANGUAGE!